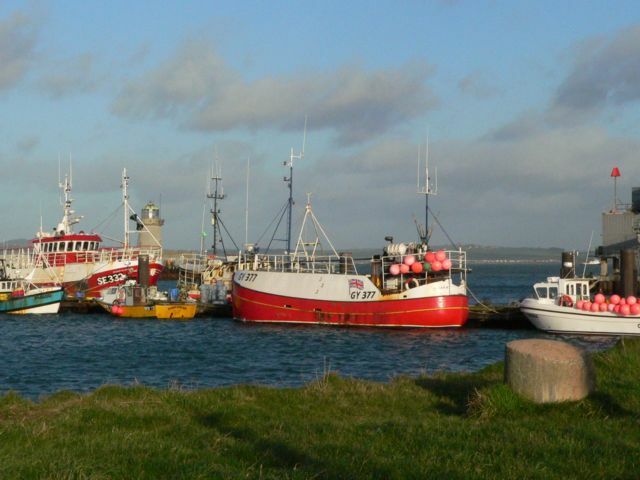 A view of Holyhead fish dock, and a selection of fishing vessels from various ports in Britain. The lighthouse in the background was designed by John Rennie in 1821. He also designed a matching tower at Howth, 60 miles across the Irish Sea. This lighthouse is relevant to take special interest in, as its one of the surviving works by John Rennie, we have another section on the industrial revolution. There were two John Rennie, one known as 'John Rennie the elder' and the second as 'Sir John Rennie', the son of the first. They were in partnership and worked together until the death of 'John Rennie the elder', when the younger one continued their projects. They are credited with many major developments and it is the elder who is said to have been a major influence in the first industrial revolution. I think this lighthouse is the work of the elder, no one makes it very clear, and if so, then this would be one of his last works. Our article on Industrial Heritage, leads into the whole topic and the industrial revolutions. It is also said to be the the second oldest lighthouse in Wales, after the Point of Ayr Lighthouse. From Wikipedia - "There have been three lighthouses located on the island. The current Lighthouse, the Holyhead Mail Pier Light is a conical white house which was built in 1821.The Lighthouse (grid reference SH256829) was designed by the civil engineer John Rennie in 1821. It is probably the second oldest lighthouse in Wales, after Point of Ayr Lighthouse. The tower survives intact and has beautifully curving gallery railings, similar to those at Bardsey Island Lighthouse . There is a matching tower in Howth, Ireland, also designed by Rennie, for the other terminal of the Irish packet steamer. The Lighthouse is no longer in use, although it is used as a navigation reference for sailors. The Lighthouse is of national significance as one of John Rennie's surviving works. He was one of the most eminent engineers of the world’s first Industrial Revolution. Of particular importance, in a Welsh context, is the early date of the lighthouse lantern, which was originally lit by gas. Before the conversion to electricity a gas works was located on the island, to power the Lighthouse, the piers and even part of Holyhead itself. The works were constructed at a cost of £130,000, an astronomical sum at the time." Do you know anymore about this lighthouse, if so let us know so we can enhance this guide.